With all of the amazing new releases coming out of NAMM 2019, we have seen a long list of microphones, but not many in the family of all-in-one USB desktop recording. Until now, that is. Apogee Electronics was quick to introduce its brand new HypeMic USB microphone for users who need a quality-sounding microphone for their own personal projects, but can’t afford to buy an interface, a DAW, or basic plugins — or don’t have the skills needed to sort through the multitude of bells and whistles of Pro Tools or Logic. 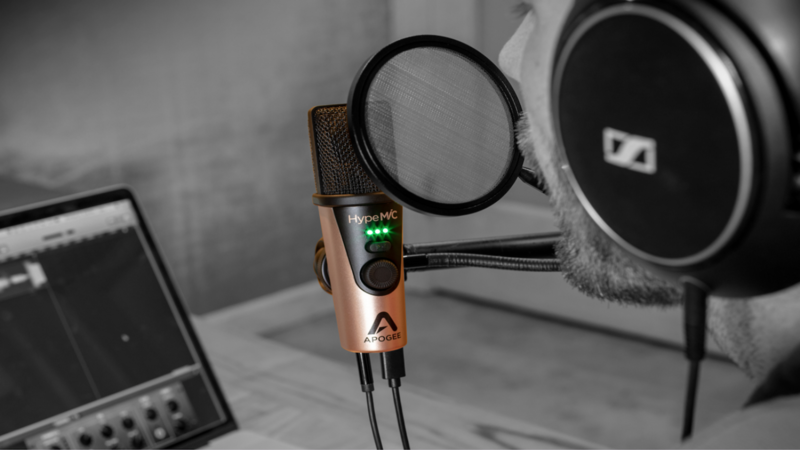 The Apogee HypeMic was designed for users to work around all of these potential roadblocks, and includes most of the basic features they might need in a simple plug-and-play device. The Apogee HypeMic is best implemented in recording for vocals (dialogue or singing), and close-micing acoustic instruments. It features a built-in analog compressor with three distinct compression types: shape it (least), squeeze it (medium), or smash it (high). The compressor can be activated by a big circular button and dial right on the front, located just below the headphone output blend control. The button is used to select compression levels, while the dial is used for input gain control. The HypeMic captures sound in a cardioid pattern, and its inputs, located at the bottom of the mic, are a pair of a 1/8″ headphone jack, and a microUSB port for connectivity. While this is convenient since many users, (especially those with android phones), likely have a sea of microUSB chargers laying around the house, it is also unfortunate that Apogee has not followed the USB-C train with this new product, as microUSB as a standard is on its way out. In either case, the Apogee HypeMic absolutely appears to be a quality microphone for podcasters, or those who need a quick demo recording of their vocals or acoustic instruments. The HypeMic is available at a price of $349 — and for a price like that we certainly hope that it has a sound to be reckoned with. To learn more about the Apogee HypeMic, visit the company’s official website, and to buy one for yourself you can use the links below.